Garrett practices with the firm’s Business and Corporate, Real Estate, Cooperative, Government Law, and Frac Sand, Mining and Minerals Sections. Garrett’s legal practice centers on providing businesses and individuals expert legal counsel on issues relating to business formation, operations, and succession planning. Garrett also assists individuals in developing estate plans which most efficiently achieve each client’s objectives. Garrett has a specialty in farm and business succession planning. Having grown up in a farming family, Garrett understands the complexities involved with transitioning a family farm. In addition to business succession and estate planning matters, Garrett advises clients in regard to business formation and the sale or purchase of businesses. 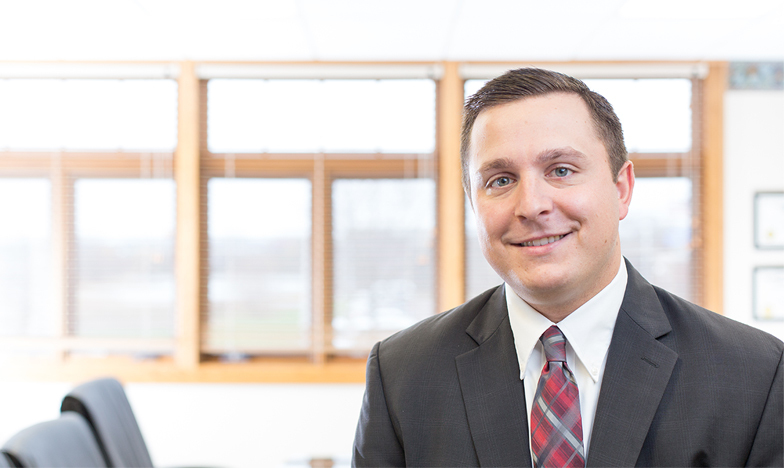 Garrett also serves as municipal counsel for several government entities throughout Western Wisconsin. Garrett received his undergraduate degree from the University of Wisconsin-Stevens Point, with a B.S. in Economics and his law degree from Marquette University Law School. While in law school, Garrett provided regulatory compliance analysis while working for a Fortune 500 insurance company and also interned in the legal department of a large health care provider in Western Wisconsin working on issues including risk management, contract review and negotiation, and employment law. He also participated in the Robert F. Wagner National Labor & Employment Law Moot Court Competition. Since becoming a lawyer in 2012, Garrett has worked with numerous individuals and businesses with planning and transactional matters. Whether you need assistance with a simple will or trust, or are in the process of buying or selling a business, Garrett can provide expert guidance and advice to assist you with each step in the process. Garrett is a member of the American Bar Association, Wisconsin Bar Association, Eau Claire County Bar Association, the Tri-County Bar Association, and the Young Professionals of the Chippewa Valley. Garrett was raised in rural Osseo and currently lives in Osseo with his wife. Garrett is involved in area youth, high school, and amateur baseball teams and also enjoys spending his free time hunting and fishing.